In small bowl, mix all sauce ingredients well; set aside. In large bowl, beat flour, salt, cumin, baking powder and garlic powder with wire whisk. Stir in beer and water until no dry flour mixture is visible. Heat oven to 200°F (or set to warm). Line cookie sheet with foil. Place wire rack on lined cookie sheet and place in oven. In 4-quart Dutch oven or deep fryer, heat 1 1/2 inches oil to 375°F. Dip fish strips in batter and remove with tongs, holding fish strips over bowl so excess batter drips off. Lower fish strips into hot oil. Repeat with remaining fish strips. (Do not crowd pan; cook only as many fish strips at once that will fit in pan without touching each other.) Cook fish strips 4 minutes on one side until golden brown. Turn fish (flip fish away from you to avoid being spattered with hot oil) and cook 3 minutes on other side until golden. Remove fish from pan and place on wire rack on cookie sheet. Keep fish warm in oven while you prepare remaining strips. 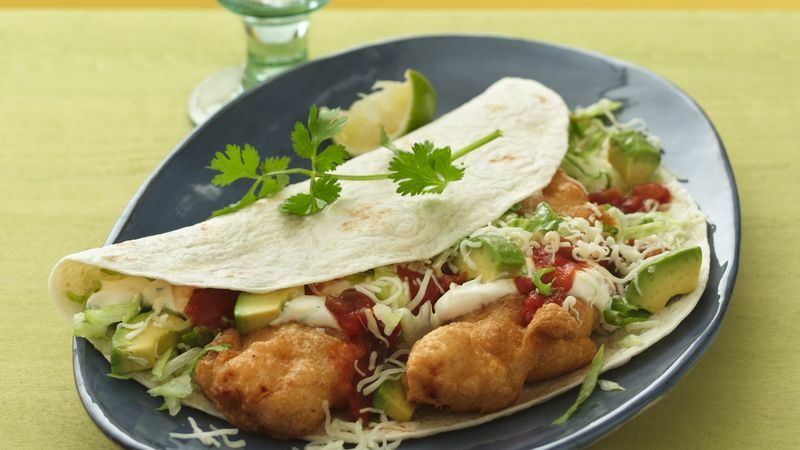 To assemble tacos, place 1 or 2 fish strips on center of each tortilla. Top with about 2 tablespoons sauce, the lettuce, salsa, avocado, cheese, a squirt of lime juice and the cilantro. Why it Works: The Right Oil for Frying There has been much talk lately about health and flavor differences among oils, but oils also differ in frying behavior. As oil is exposed to the high heat of frying, it begins to break down. If heated to too high of a temperature, oil quickly begins to smoke and break down; this temperature is called its “smoke point.” Every time oil is heated, its smoke point is lowered. For example, a fresh pan of peanut oil may begin to smoke at 450°F, but after the oil is used two or three times, it may smoke at 375°F. Oil at its smoke point can be dangerous because it can catch fire. It may also give off-flavors to foods. Keep it safe by only using an oil a few times to deep fry. Also choose oils that have a high smoke point when fresh. The best oils for deep-frying are soybean (vegetable), corn, sunflower, peanut and canola.